Increase your protection against bug bites, tick bites, flea, bee, ant, and spider attacks, Lyme Disease, and West Nile Virus. •Within minutes, you will notice the bugs go away. Spray around the door and house and you can watch the ants, insects and fleas run away. Nothing bad is left behind: no bugs and no stains. All that stays is a wonderful fresh scent. Special all natural formula that kids can use without harming themselves and you do not have to worry about spraying it on your skin. It will not harm you but is a natural skin emollient. Irresistible fragrance that you can wear daily as cologne or perfume and yet will also keep you protected indoors and out. •Relieves your stress. Most of the ingredients are essential oils that are known to calm and soothe the body and soul-- while keeping all the insects away. •Unlimited uses. Can be sprayed on clothing, furniture, around the house, yourself, your animals, and car without worry. No stains or stickiness to clean up and will not harm or irritate the skin. •You do not know that you have it on. Your skin is smooth, not sticky.•And, best of all it is completely non-toxic. It will not hurt you, take 5 years off your life or the lives of your family and pets and does not cause cancer. •And just to make the deal sweeter, you get a 30-day money-back, no questions asked guarantee! You get to try the product for 30 days and see if it does what we have claimed that it will do. The ingredients contained in Bugrepel have been scientifically PROVEN to be 50% STRONGER than DEET so we know you will be satisfied! 1. Q: What are the advantages of using Bugrepel® Natural Insect Repellents? How does your product differ from over-the-counter chemcials AND from the "other" natural products that promise to repel bugs? •Bugrepel® Natural Insect Repellents are the only 100% chemical-free insect repellents that protect against all types of insects and pests, including rodents, deer, birds, rabbits and even disease-carrying mosquitoes, flies, ticks and fleas. • Bugrepel® Natural Insect Repellents contain not 3, not 6, not 9, but 12 essential oil ingredients scientifically proven and accurately combined to provide maximum natural protection against insects and pests of all kinds. The "other guys" only protect against certain classes of insects and are limited in their ability to protect. • Bugrepel® Natural Insect Repellents are made in a soybean oil (Extra Strength) or water base and are long-lasting when used as directed, will not stain clothes, and act as a natural skin protectant and emollient, does not smell like a chemical and, being made from herbal and floral essential oils, actually have a pleasing, fragrant smell. 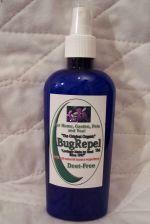 •Bugrepel® Natural Insect Repellents actually cost LESS than those over-the-counter brands! Just ONE 32 oz. bottle of Bugrepel¨ will last you several months and costs pennies per ounce when compared with the toxic, chemical insect repellents. • Bugrepel® Natural Insect Repellents can be purchased securely online using your VISA, Mastercard or other major credit card, by telephone toll-free at 1-877-278-8456 or by mail. Please visit our catalog for a complete list of our Bugrepel® Natural Insect Repellent Products, for you, your pets, your home and yard. Even horses and other large animals can benefit from Bugrepel®! 2. Q: Is Bugrepel Safe to wear on my skin? A: Yes, it is safe to use on the skin. Bugrepel products are actually all natural skin emollients that are calming and soothing to the skin. 3. Q: Is Bugrepel safe for my pet? A: Unlike chemical insect repellents that can literally take 5-7 years off your life and the life of your pet, Bugrepel is safe for your pet and many pets actually like the scent. The lavender in it is naturally a soothing scent. It is a natural deodorizer, too. 4. Q: Is Bugrepel safe for my children? A: Bugrepel is made up of 16 different natural essential oils in a soybean oil (Extra Strength) or water-base (regular strength) solution and is completely safe for children. 5. Q: What's wrong with just using over-the-counter non-DEET products like Avon's Skin-So-Soft and others? A: To quote Jim Davis, marketing manager for Greensboro, N.C.-based Morflex Inc., and maker of 65 percent of the world's DEET supply, "Avon uses citronella for Skin-So-Soft bath oil and a German-made synthetic called IR3535 for Skin-So-Soft Bug Guard Plus. "Avon has basically taken the non-DEET approach to making repellants," said Davis. "We find that the citronella can work but its concentration in Avon's bath oil is not that high. As for IR3535, it's more effective on some bugs and less effective on others. It seems to be ineffective against mosquitoes." Plus, with an ominous-sounding chemical name like "IR3535" do you really want to trust it on your skin? So yes, it may be cheap, and it is available "over-the-counter," but then so are beer, cigarettes and DEET products. And, speaking of beer, Avon Skin-So-Soft and most other insect repellents, "natural" or not, contain some form of alcohol...but then, you wondered why it left you with a heightened sense of (false) well-being, didn't you? Bugrepel Natural Insect Repellents, however, contain not a speck of alcohol or any chemical, or harmful agent. 6. Q: How long does it last? A: Bugrepel will last on your skin until you wash or sweat it off. 7. Q: What other uses are there for Bugrepel? • Outdoor parties, spray on the furniture and table cloth to keep the insects, ticks, and ants away without worry. • Spray around doors and windows to keep insects out. • Spray around the kitchen, bathroom, attics, and under furniture to remove and keep out all insects, ticks, moths, ants, cockroaches, and fleas. • Use in the garage and bathroom and smelly areas because Bugrepel not only removes insects but cleans the air of foul odors. • Mix with water & mop on floors to keep insects out without stickiness, bad smells, or harsh chemicals. • Keeps cockroaches and Palmetto bugs away. • Keeps ants and even red ants out. • Use around the pool to keep insects away. • Use the concentrate in the barn or other structures to keep all insects out. Please visit our catalog Your PrivacyWe understand that all of the customers expect a very high level of privacy. We will do everything to assure your privacy and complete anonymity. You will not be added to a mailing list or receive spam from any other companies. Your name, address, and email will not be given or sold to any other companies. All items are shipped discreetly without any indication as to the package contents. Copyright 2000-2012 Be Happy Bugrepel. All rights reserved. Text and graphics are protected by US & International copyright laws and may not be copied, reprinted, published, translated, hosted or otherwise distributed by any means without explicit permission. Note : We DO NOT use : Oil of Aloe, Chrysanthemum , Citronella, Penny Royal , Tea Tree (also known as Melaleuca) or Wormwood because of the extreme toxicity levels and the potential of causing fatality in animals and or humans. 100% Made in America Please visit our catalog • Questions click here • p: 877-278-8456 • .